Home Latest News Slider Precision Air Suspends Flights To Hahaya - Comoros. 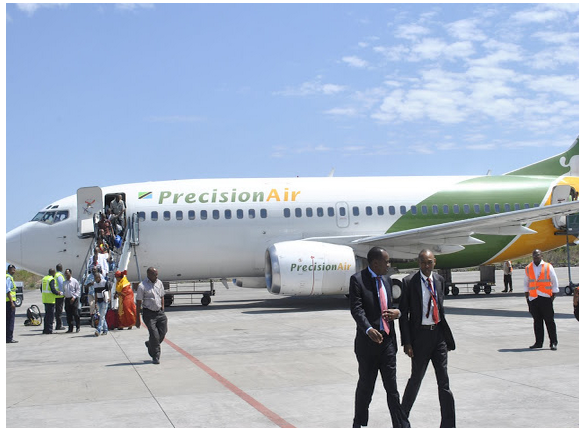 Precision Air Suspends Flights To Hahaya - Comoros. Tanzania premier airline, Precision Air, has announced the temporary suspension of its operations to Hahaya (HAH) effective 24th Sept 2014. According to the communication issued to Travel Partners, this suspension is the result of an unavoidable reorganisation of the airline's route network and flight schedules. Passengers holding tickets on the affected flights will be rebooked on other airlines on involuntary basis where regulations allow. For cases where regulation prevents Precision Air from re-accommodating on other airlines, passengers will be refunded the full amount of the unutilized portions of their tickets with penalties waived. Arrangements have been made to facilitate the refunds through Precision Air or Travel Agent Offices. Precision Air B737-300 when landed for the first time at Prince Said Ibrahim International Airport in Hahaya - Comoros in 2011.